Surveys have shown that children who eat a lot of fruits and veggies when they are young tend to continue this eating habit when they’re adults. But how do you get your children to eat vegetables? Eat them yourself and model good child nutrition. The more vegetables the adults in the family eat, the more the children are likely to eat. As they say, monkey see, monkey eat. And remember, tastes change with age – children who turned down vegetables as babies may eat them when they’re toddlers. Keep offering, but don’t force the vegetables. If baby refuses squash at six months, offer it again at nine months. Use modeling, not bribery or threats, to get your child to eat vegetables. Good eating habits, like good sleeping habits, can’t be forced on a child. 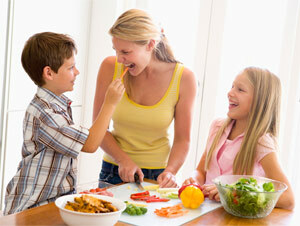 The best you can do is create a healthy eating attitude in your home and let your child catch the spirit. You job is to serve and eat lots of vegetables, be excited about them, prepare them in a variety of appealing ways, and dress them up to have kid appeal. The rest is up to your child.